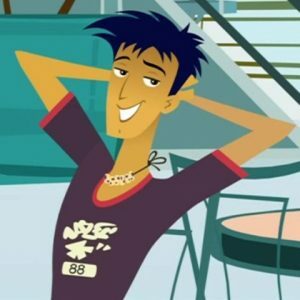 Decided to finish up the “6Teen” series, so on the heels of my posts about Wyatt and (last week) Nikki, here’s one for Jonesy Garcia. Jonesy’s personality is the polar opposite of his friend Wyatt’s. Jonesy’s usually shown as being an egoistical guy with a penchant for hitting on any woman he meets. This applies even one of the series’ minor supporting characters, an adult woman with a bratty six-year-old. Despite this, Jonsey has an on-again, off-again relationship (though largely “on” by the end of the series) with Nikki. Caitlin: Can I borrow your costume tomorrow? I don’t think I can show my face around here for awhile. Jonesy: Wish I could, but I got fired for being a bad role model for kids. Go figure. Jonesy being put in embarrassing situations is another popular running gag. Jonesy stripped pantsless seems popular. These often come as some sort of ironic payback for his behavior. One episode sees the gang meet oddly-similar doppelgangers of themselves. Jonesy’s counterpart is the similar-looking “Smithy,” who also repeatedly gets fired. This prompts Jonesy makes fun of Smithy’s generic-sounding name. In turn, the gang make fun of Jonesy’s similarly-generic name. A subplot in the series involved Jonesy’s father dating (and eventually marrying) his friend Jen’s mother, making the two step-siblings. Jonesy also has two younger siblings occasionally seen, Diego and Robbie. Robbie is a grade schooler who’s an out-of-control brat. Diego is pretty much a junior-high version of Jonesy. All three siblings seem to enjoy pulling pranks on Jen (and her adult sister, Courtney). Terry McGurrin, a Canadian actor/writer, voices Jonesy. The Quebec French dub of the series changes Jonesy’s name to “Costa Rica.” No, I don’t know why they called him that, either. I am not sure what is so “Caucasian” about Smithy. He has the exact same skin tone as Jonesy, and his last name is never mentioned. He has a deeper, more serious version of Jonesy’s generic Canadian accent. He has thick, smooth red-brown hair instead of Jonesy’s stringy blue-black shag, and he has a pug nose instead of Roman; other than that they look identical–and identically nonwhite. I’m Latin American (presumably Jonesy’s ethnicity) and I look a lot like him, but for Smithy I am a dead ringer. Please explain yourself, or better yet change the entry. Other than that good article, and good website. Nothing to explain: just hadn’t seen the episode in awhile when I wrote it, and misrememebered what Smithy looked like. Entry fixed… thanks.